This blog is designed to give you some ideas and tools to help with Planning and Preparation in order to overcome Procrastination. Without a doubt Planning is the key to success and there are various tools we can use. I will be sharing some useful ones I use personally. 2013- Training/ Social media focus. Why is this relevant? Well, this is helpful as it allows me to see my overall focus per year and I can plan a deliberate focus on areas I may have neglected. This covers the main areas (work, family, rest, play) we need to keep sane, balanced and healthy! So 24 hours still remaining! That’s a whole day! This proforma is useful when you’re tempted to think there’s never enough time in the day! It’s all down to discipline! Do your own Proforma for a balanced life and let me know how you get on! The “postponed” scribbled on this struck me as funny, so I spent a few minutes to get a good photo of it. I can get to my work a bit later. Spotted in the music department at the Univeristy of Birmingham. Ask yourself these set of deceptively similar questions. Read each carefully. Keep the goal the same as you work through the set of questions. Your goal might be to switch off the TV at 10pm. Because you know if you do this, you can read a book for half a hour before bed – which will help you relax and unwind and have a good nights sleep. And the consequence of this is that you wake up more refreshed a energised the next day. This in turn helps you have a productive, enjoyable and satisfying working day. What will happen if I achieve my goal? e.g. What will happen if I switch off the T.V daily at 10pm? What won’t happen if I achieve my goal? e.g. What won’t happen if I switch off the T.V daily at 10pm? What will happen if I don’t achieve my goal? What will happen if I don’t switch off the T.V daily at 10pm? What won’t happen if I don’t achieve my goal? What won’t happen if I don’t switch off the T.V daily at 10pm? List all the responses you get for each question and write freely do’t be tempted to over-think or censor yourself. This is a popular NLP tool to help you consider a goal from all angles and to help you develop a real felt sense of the full meaning of a goal. Identify and write down the goal. Assume you have achieved this goal and begin with this frame of mind. (Environment) In what space, setting or circumstance was this goal is achieved? What environment – people, places made it possible? (Behaviour/ Actions) What actions did I take to achieve this goal? Be as detailed as possible. (Resources) How did I do it? What resources did I use to achieve the goal? (Beliefs) Why did I want to achieve this goal? Why was/is this important? (Values) What’s important about this? Give the reason. (Identity) Who did I achieve this goal for? What persons? or part / parts of this person? (Spirit) Who else will benefit or is benefitting? What else is / will be impacted by my achieving this goal? And how? Do let me know what you think of these tools and if there are any others you find more useful, then let me know. Read this humorous blog about ‘Why procrastinators procrastinate’. It will make you laugh! Some quotes on procrastination to inspire you to action. However, if you found the above useful, you may be interested in the ‘Setting my Intention for the year ahead’ workshop. This focusses on Planning and Goal Setting Skills. See here for the next session. 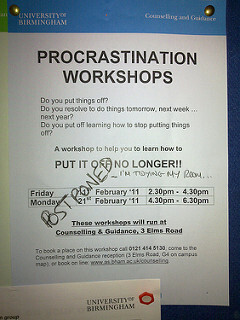 Or attend the next ‘Beat Procrastination (I’ll do it later) workshop. Post your comments about this blog below!